Some amazing technological advancements have occurred in the heating and cooling industry in the past 20 years. Today’s modern systems offer many more options to homeowners, from advanced humidity control, to sophisticated temperature controls, to built-in air purification, to even the ability to control your system remotely. If you’re in the market for a new system, know your options! SEER. In the 1990s the DOE (Department of Energy) mandated a minimum SEER rate of 10 for all new air conditioners sold in the United States. In 2006 the minimum was changed to 10 SEER. 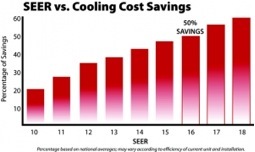 If you have a 10 SEER air conditioning system from 20 years ago, you can upgrade to a 16 SEER and experience a 50% savings in your monthly cooling costs. And with these higher efficiencies you’ll experience a much quicker payback on your equipment. Heat or Humidity? Humidity affects your body’s ability to cool itself. Current heating and cooling systems have integrated dehumidifier options, which allow you to control the humidity level of your whole home. In the summer, by decreasing the level of humidity in your home, you’ll feel cool, allowing you to turn down your air conditioning. And turning down the air conditioning means lower utility bills for you! Digital Thermostats. Today's electronic thermostat models are a vast departure from earlier mechanical styles, which basically allowed you to set and adjust temperatures manually. The settings that come with modern programmable thermostats are intended to deliver savings without sacrificing comfort. Depending on your family's schedule, you can see significant savings by sticking with those settings or adjust them as appropriate for your family. Remote Access. Remote Access is a major innovation in heating and cooling. Systems with this feature allow homeowners to monitor the components and get system status feedback. It can also halt the system when a major problem is detected. Another great benefit of Remote Access is the ability for homeowners to adjust temperatures when they are away from home through a computer or smart phone. Built-in air purification. Twenty years ago air quality was not recognized as an important issue like it is today. The EPA (Environmental Protection Agency) declares indoor air quality a major concern for Americans, citing Americans spend over 70% of their time indoors. Today whole home air purifiers and air cleaners can be added to your heating and cooling system, providing clean air to your entire home. The heating and cooling industry has come a long way in 20 years. If you are in the market for a new system make sure to investigate all of the options available and contact a reputable, licensed HVAC professional to help you pick the system with the options that best fits the needs of your family and lifestyle.